Matt was looking for a non-traditional spring break, so he invited me to do an overnighter. When the Sawtooths were predicted to get a heat wave on a deep fresh snow pack, we looked elsewhere. 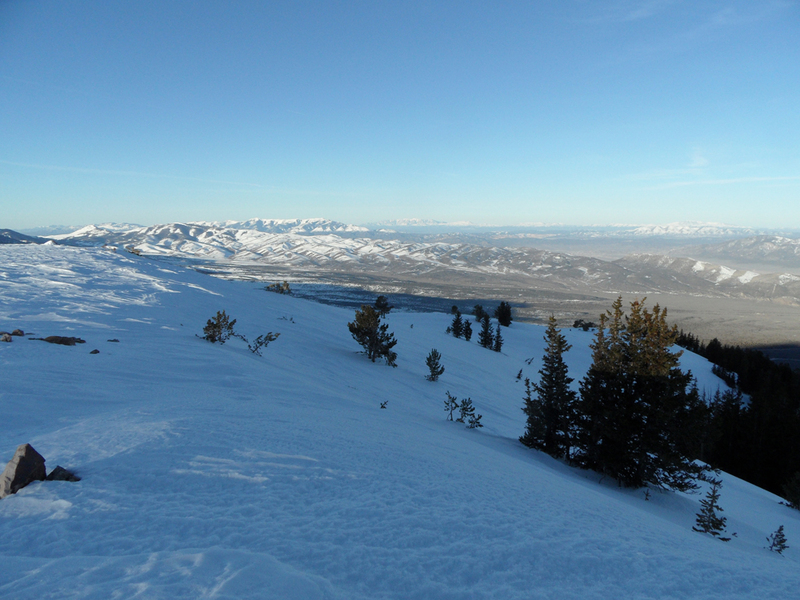 I borrowed an idea from Michael (sorry, Michael) and we headed for the Schell range near Ely, Nevada. This is classic basin-and-range, complete with major foreshortening of almost every view. 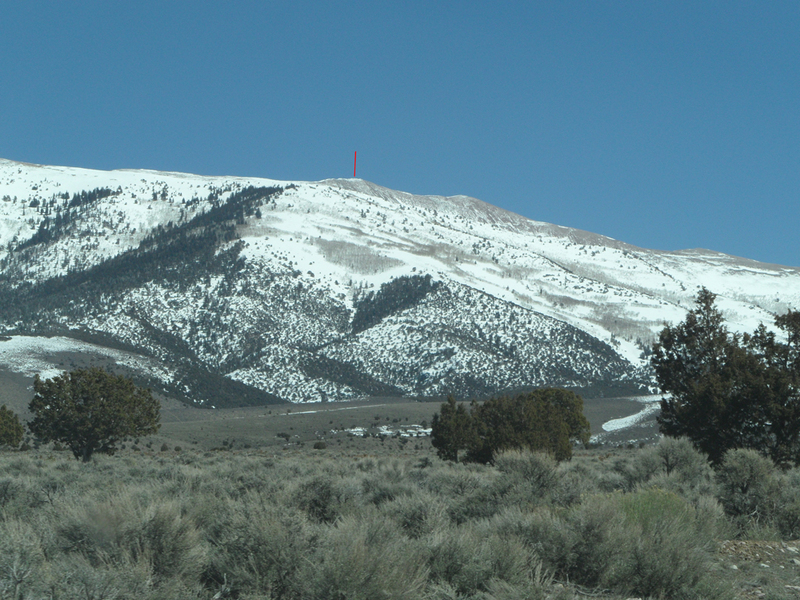 A little red line shows the summit from our campsite at the cattle guard (the road turned to snow immediately after) at about 7600'. 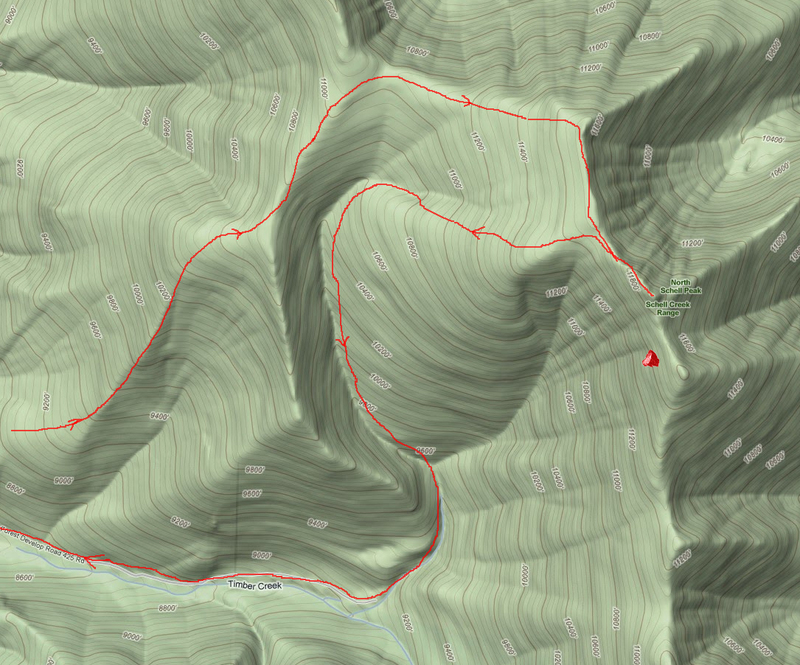 The Summitpost route info started at the trailhead, another couple miles up the road, and a little over 1000' higher. This map shows most of our route. Leave it to me to take a short hike and expand on a theme. After some discussion, we decided that instead of following the road up Timber Creek, it would be both efficient and fun to start climbing immediately and follow the ridge around the upper Timber Creek cirque. Also considering the afternoon heat at our campsite, we decided to get an early start. So after about an hour, dawn was breaking and we were already over 1000' above camp (which was below the snow line). 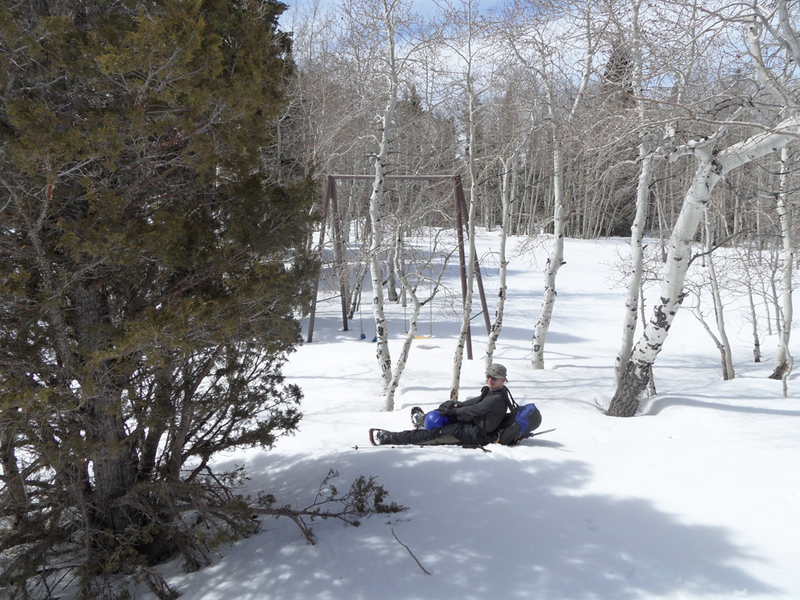 As the snow got deeper and steeper, we put on our snowshoes. The mild grade and firm snow allowed us to continue fast progress, and we were overlooking the cirque at 10,800' in just over two hours. Matt is in the picture, but you'll have to click to get a bigger version to find him. 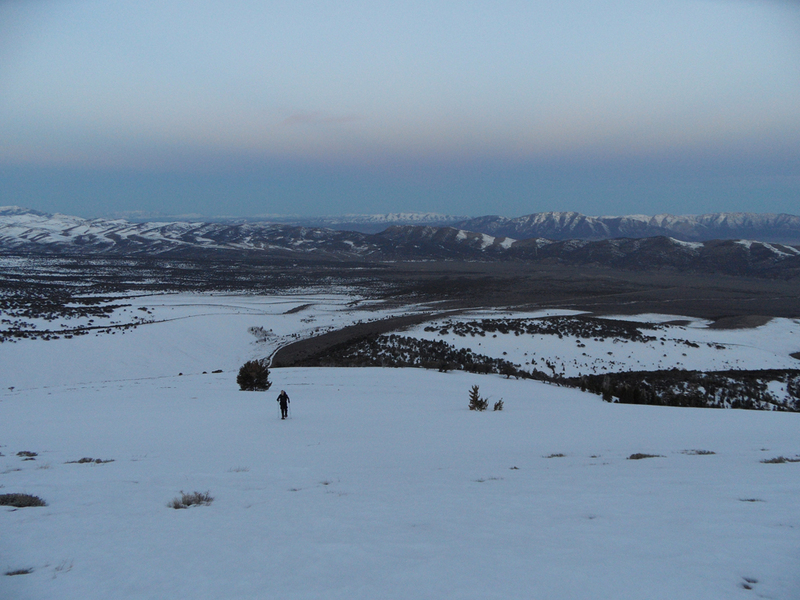 As the sun hit the ridgetop, we sat and had a nice snack break in almost zero wind. 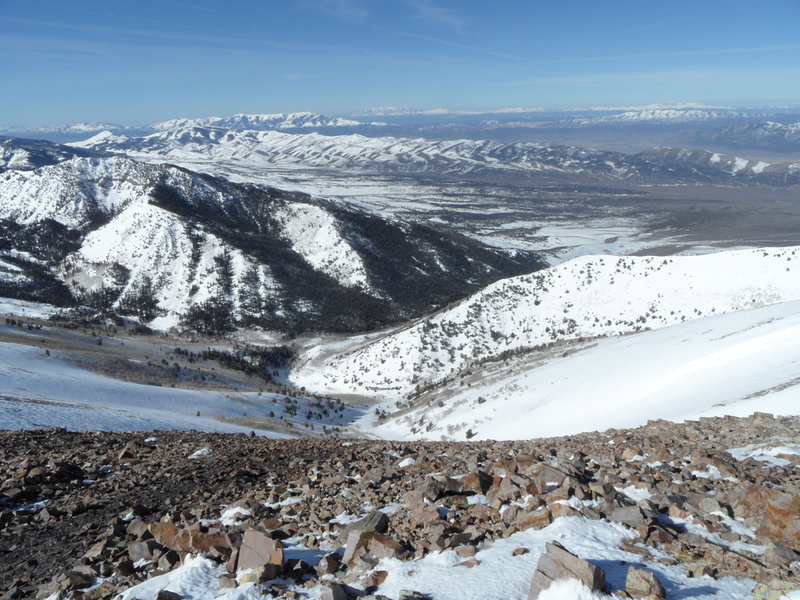 The panorama below gives our first view of the summit, and also the Timber Creek cirque. 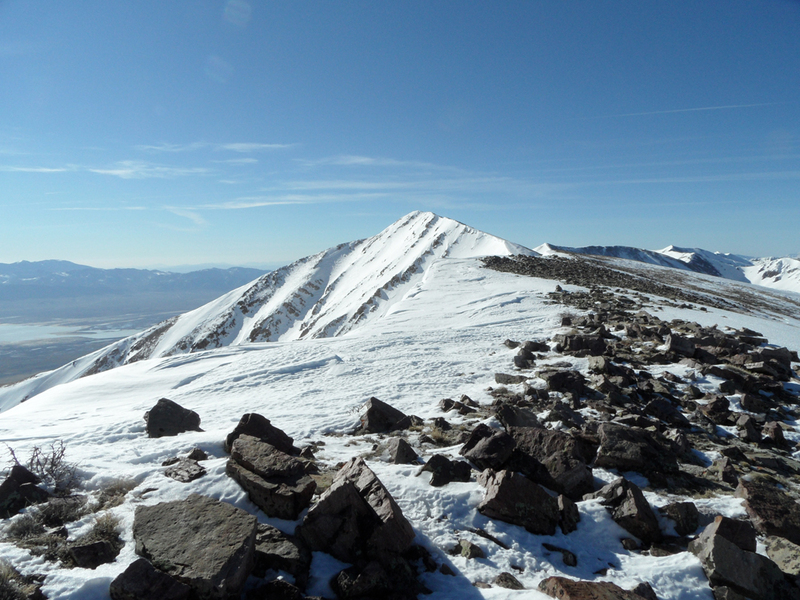 Our route stayed on the snow to the saddle on the left, then walked the ridgetop talus to the summit. Here's looking south from near the saddle, back down the upper ridge. And then from the other side of the cirque looking south again, only this time at the summit. And the panorama below is Matt about to step on top. 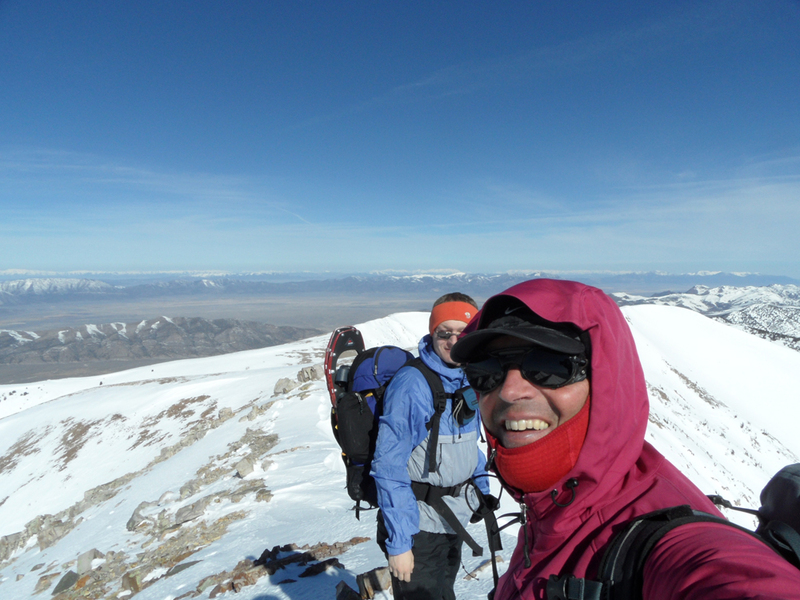 The very summit was very hardpack, almost icy, with a big drop off the east side. Although we carried crampons we never did put them on, so on this little perch we didn't have the liberty to move around for proper photo orientation. As you might be able to tell, the wind had picked up and it was cold, although not too bad for 9:25am (Pacific time). 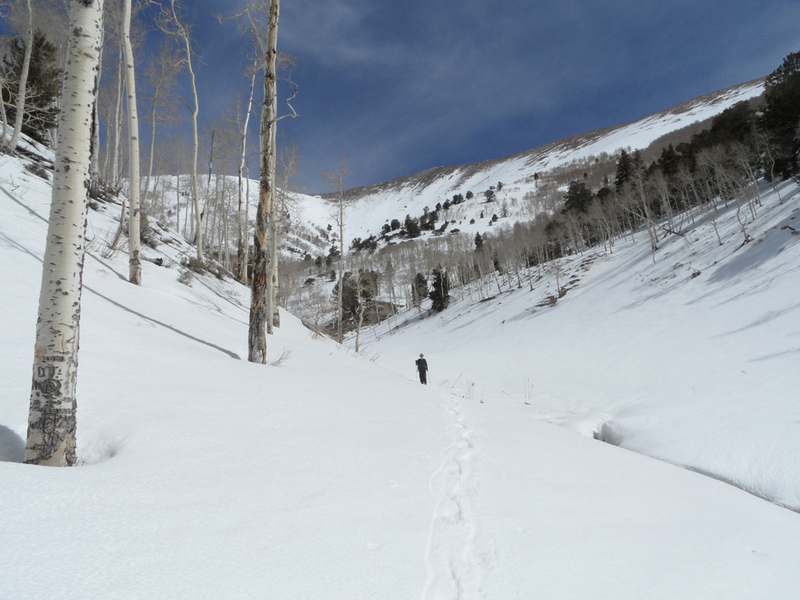 To make a loop of it, we decided to return via the normal route, following the bottom of Timber Creek. When we got down into the drainage, it was already very warm. Very. 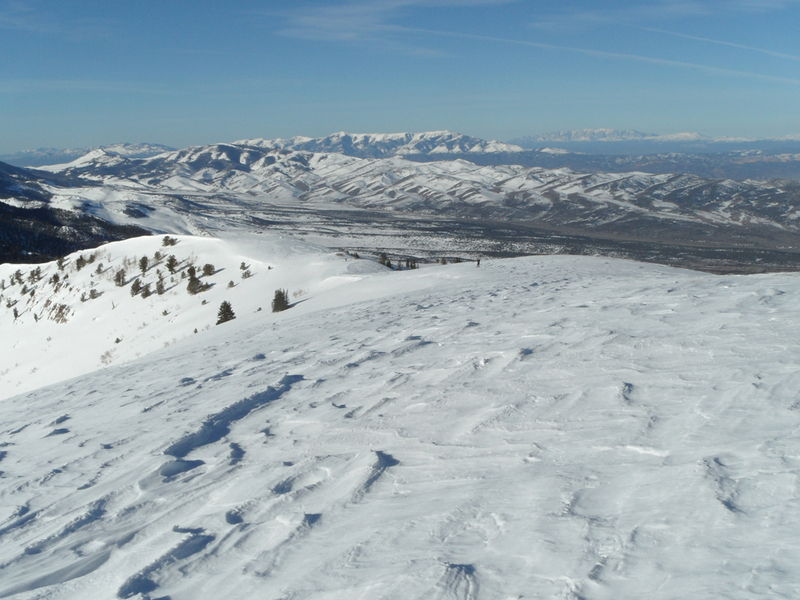 The snow down here was starting to turn to slurpee, so instead of speeding down the creek bottom, we had to sidehill above the terrain trap for about 1.5 miles of ankle-stretching sidehill. This is looking back up from below the narrow section. In the lower reaches, there is a Girl Scout camp and also a Forest Service campground, complete with this playground. If you look behind Matt you will see the swingset, but it's hard to see the little blue whale that Matt is riding. Gee, spring break is fun!